Even amongst the 5 internationally recognised certificates, there are differences. In fact, the diamond industry benchmarks every diamond against the GIA's (Gemological Institute of America) strict standards. 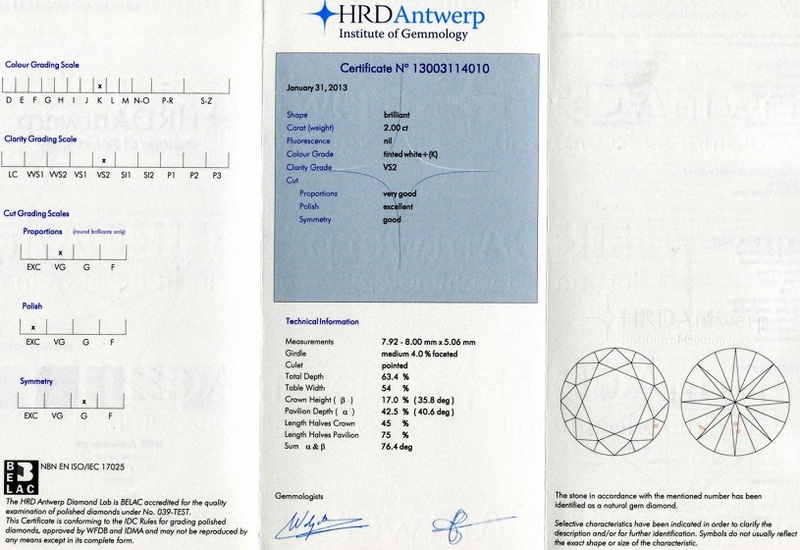 Comparing a diamond with a GIA certificate against an IGI or the weaker EGL is not an equal comparison. So like-for-like colours or clarity grading on EGL would be graded 2/3 grades lower if sent to GIA and therefore should reflect lower prices. The 5 leading diamond certification organisations issue a unique number for every diamond, to protect the consumer. 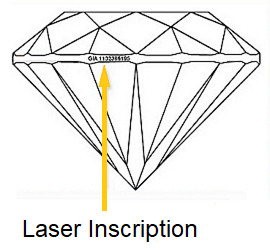 On most new GIA certificates and selectively on some other certificates, this number is laser inscribed in the diamond's girdle, and can be easily verified with a magnification loop. This assures you the diamond you are buying is the actual one. Documents the carat weight, clarity and colour grades of a diamond, as well as its exact measurements, and in the case of Round Brilliant cuts, a cut grade. See above for an example. Issued for diamonds weighing less than 1 carat. Describes colour grade and colour origin (i.e. natural or treated) of coloured diamonds of any size. A full colour image may also be requested as an additional service. Found in 1934 by GIA founder Robert M. Shipley, the AGS is a trade association of retail jewellers, independent appraisers, suppliers, and selective industry members. Members are held to a high code of ethics with emphasis on consumer protection and education. The Society trains and certifies jewellers, gemmologists, and jewellery appraisers. Diamond grading is the specialty of the American Gem Society Laboratories and the Society has developed its own cut, colour, and clarity standards. A document evaluating the colour, clarity, carat weight, and cut of a diamond, including a detailed diagram plotting the diamond's proportions and illustrating any present inclusions. 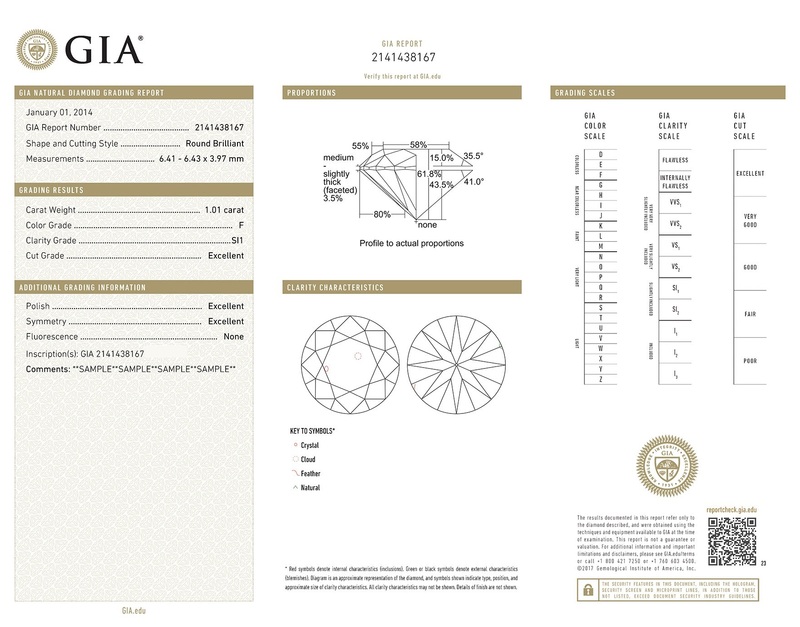 A report detailing the cut, colour, clarity, and carat weight of diamonds in both AGS and GIA terminology. Founded in 1976 to meet the growing demand for reliable diamond certificates, the HRD is a non-profit organisation at the service of the Belgian diamond trade and industry. Since its foundation in 1976, the HRD Certificates Laboratory has expanded into one of the largest diamond certification labs in the world and maintains an excellent reputation for quality and objectivity. Each diamond is examined independently by several experts withvery sophisticated machinery, such as spectophotometres, Dia-Mention systems, and cathode luminescence apparatus to ensure a high level of reliability. 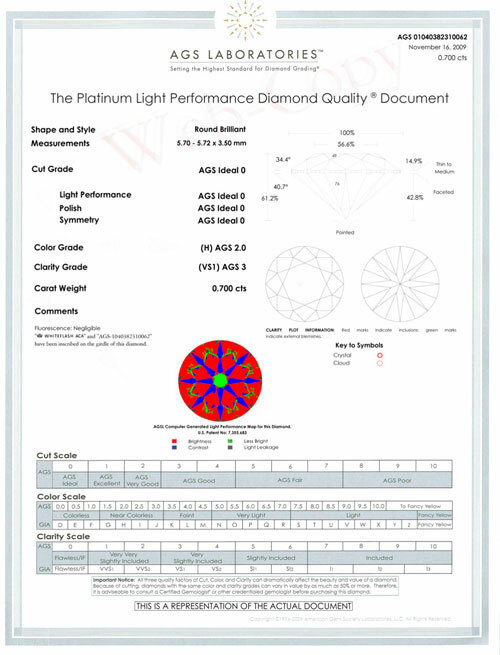 A certificate detailing the shape, measurements, carat weight, clarity, fluorescence, colour and finish grades of a diamond as well as a plotted diagram. See above for an example. A simpler version of the diamond certificate detailing the same characteristics as above but without a plotted diagram. A certificate outlining the colour description, origin and luminescence of fancy coloured stones. One of the leading gemological institutions in the world, the IGI was established in 1975 in Antwerp, with a sister laboratory in New York, and has since become the largest independent gem certification and appraisal institute renowned for its quality services, extensive experience and expertise. What originally began with just 3 staff members has expanded to over 250 professionals dedicated to a remarkable standard of excellence in Antwerp, New York, Bangkok, Mumbai and Tokyo. The IGI issues more than 400,000 reports per year. Thousands of jewellers, retail stores, insurance companies, internet sales organisations, catalogue companies, accounting and securities firms and consumers rely on the IGI reports. International Gemological Information, a division of IGI, was established in New York in 1981, as a source for unbiased appraisals of gems and jewellery. Like its parent company, IGI Information is totally independent of all commercial sales organisations and does not trade in diamonds or precious stones. Therefore IGI Information is able to provide objective and accurate appraisals and identification reports, alongside appraisal updates and estimates in case of damage. A detailed analysis of the stone's characteristics, including carat weight, color, clarity, polish and symmetry, and proportions. A diamond diagram with plotted clarity characteristics is also included. See above for an example. A passport-sized document that contains the same detailed information as the Diamond Report, without the plotted diagram. This report is also available in a more compact credit card size. A report rating optical symmetry. EGL USA is owned and governed by a different entity to other EGLs and is one of the world's premier independent gemological labs. It has been offering services to the fine jewellery trade and consumers forover 25 years. 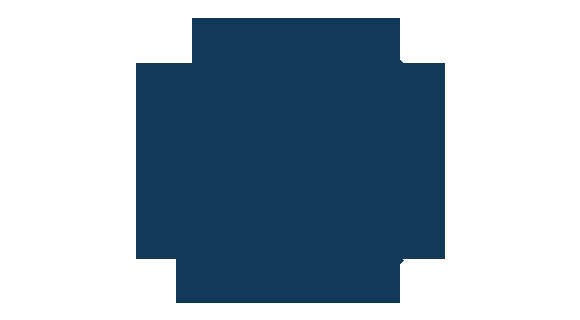 The EGL USA group is comprised of four North American labs based in New York, Los Angeles, Vancouver and Toronto. A certificate evaluating the colour, clarity, carat weight, and cut of a diamond, including a detailed diagram plotting the diamond’s proportions and illustrating any present inclusions. See above for an example. A cut grade certificate issued for round stones only. 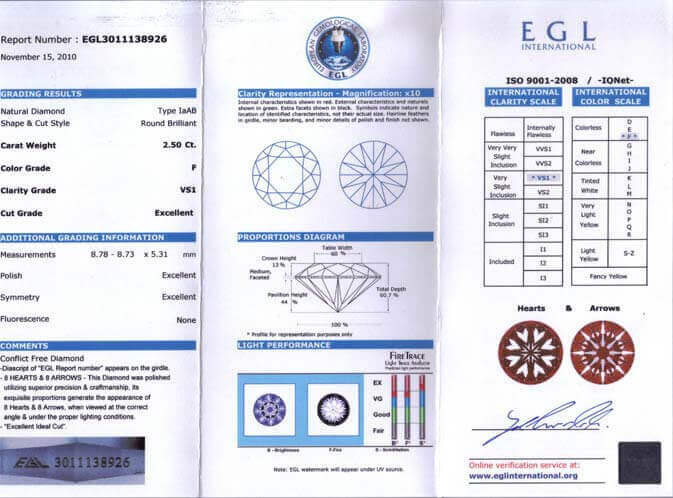 This is exclusive to EGL USA and is the most popular document for coloured diamonds. A comprehensive document outlining the details and origins of coloured diamonds. A more compact version of the Diamond Certificate, created especially for the trade. Founded over thirty years ago in Belgium, the EGL is committed to protecting the integrity of the jewellery trade and fuelling public interest through applied science, education, innovation, and exceptional services. The EGL has an international presence with laboratories based in Antwerp (1973), Johannesburg (1980), London (1981), Paris (1981), Tel Aviv (1982), Istanbul (1990), Seoul (1990), Mumbai (2003) and Cape Town (2007). 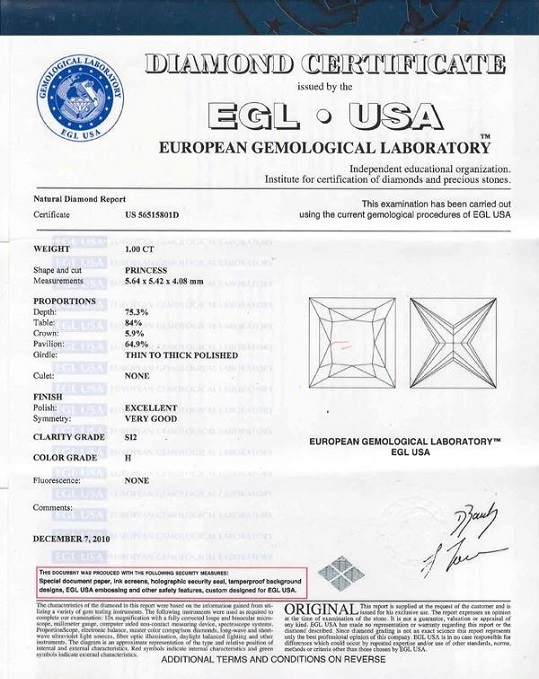 It is sometimes referred to therefore as 'GL Worldwide' or 'EGL International': The same standards apply to all these labs, but differ from EGL USA. The EGL is accredited with introducing new approaches to diamond grading, the practice of certifying diamonds measuring less than one carat in weight, and establishing the 'SI3' diamond clarity designation. The organisation is also recognised for conducting advanced research with renowned physicists, geologists, and mineralogists. A certificate evaluating the colour, clarity, carat weight, and cut of a diamond, including a detailed diagram plotting the diamond's proportions and illustrating any present inclusions. To see an example, click on the certificate on the right. 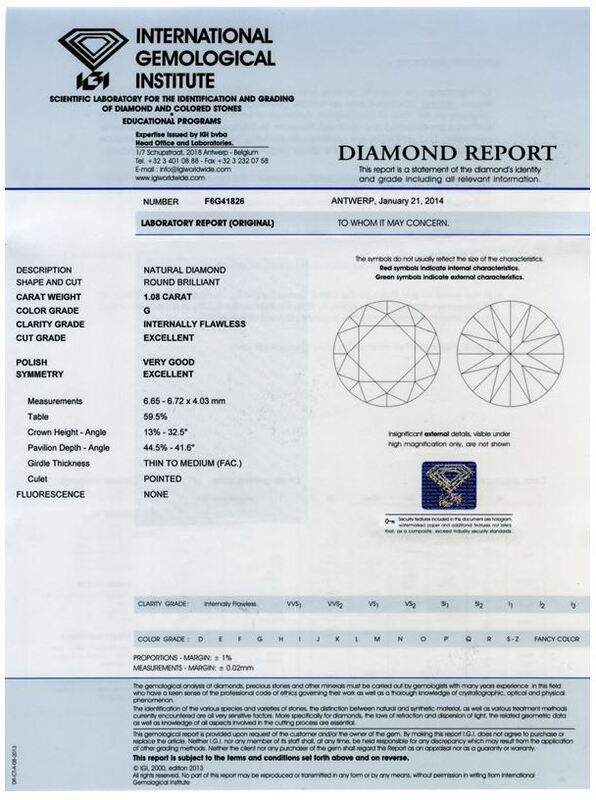 A more compact version of the Diamond Certificate Report. The most compact of EGL certificates, this details the information as in other EGL certificates on a credit card type of document.